The empirical formula is C 19 H 20 N 2 O 3 · CH 3 SO 3 H · H 2 O, with a molecular weight of 438.50. Approximately 74% of dolasetron mesylate monohydrate is dolasetron base. Each ANZEMET Tablet for oral administration containsdolasetron mesylate (as the monohydrate) and also contains the inactive ingredients: carnauba wax, croscarmellose sodium, hypromellose, lactose, magnesium stearate, polyethylene glycol, polysorbate 80, pregelatinized starch, synthetic red iron oxide, titanium dioxide, and white wax. The tablets are printed with black ink, which contains lecithin, pharmaceutical glaze, propylene glycol, and synthetic black iron oxide. 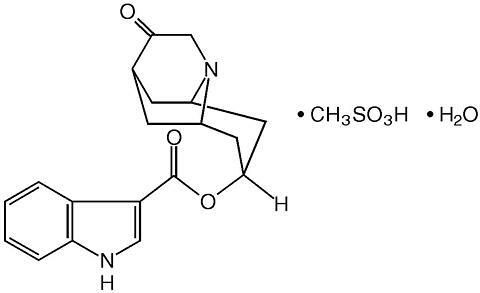 Dolasetron mesylate and its active metabolite, hydrodolasetron (MDL 74,156), are selective serotonin 5-HT 3 receptor antagonists not shown to have activity at other known serotonin receptors and with low affinity for dopamine receptors. The serotonin 5-HT 3 receptors are located on the nerve terminals of the vagus in the periphery and centrally in the chemoreceptor trigger zone of the area postrema. It is thought that chemotherapeutic agents produce nausea and vomiting by releasing serotonin from the enterochromaffin cells of the small intestine, and that the released serotonin then activates 5-HT 3 receptors located on vagal efferents to initiate the vomiting reflex. Acute, usually reversible, ECG changes (PR and QT c prolongation; QRS widening), caused by dolasetron mesylate, have been observed in healthy volunteers and in controlled clinical trials. The active metabolites of dolasetron may block sodium channels, a property unrelated to its ability to block 5-HT 3 receptors. QT c prolongation is primarily due to QRS widening. Dolasetron appears to prolong both depolarization and, to a lesser extent, repolarization time. The magnitude and frequency of the ECG changes increased with dose (related to peak plasma concentrations of hydrodolasetron but not the parent compound). These ECG interval prolongations usually returned to baseline within 6 to 8 hours, but in some patients were present at 24 hour follow up. Dolasetron mesylate administration has little or no effect on blood pressure. The reduction of dolasetron to hydrodolasetron is mediated by a ubiquitous enzyme, carbonyl reductase. Cytochrome P-450 (CYP)IID6 is primarily responsible for the subsequent hydroxylation of hydrodolasetron and both CYPIIIA and flavin monooxygenase are responsible for the N-oxidation of hydrodolasetron. Hydrodolasetron is eliminated by multiple routes, including renal excretion and, after metabolism, mainly, glucuronidation and hydroxylation. Two thirds of the administered dose is recovered in the urine and one third in the feces. Hydrodolasetron is widely distributed in the body with a mean apparent volume of distribution of 5.8 L/kg (%CV=25%, N=24) in adults. Sixty-nine to 77% of hydrodolasetron is bound to plasma protein. In a study with 14 C labeled dolasetron, the distribution of radioactivity to blood cells was not extensive. Approximately 50% of hydrodolasetron is bound to (alpha) 1 -acid glycoprotein. The pharmacokinetics of hydrodolasetron are linear and similar in men and women. The pharmacokinetics of hydrodolasetron, in special and targeted patient populations following oral administration of dolasetron, are summarized in Table 1. The pharmacokinetics of hydrodolasetron are similar in adult (young and elderly) healthy volunteers and in adult cancer patients receiving chemotherapeutic agents. The apparent clearance following oral administration of hydrodolasetron is approximately 1.6- to 3.4-fold higher in children and adolescents than in adults. The clearance following oral administration of hydrodolasetron is not affected by age in adult cancer patients. The apparent oral clearance of hydrodolasetron decreases 42% with severe hepatic impairment and 44% with severe renal impairment. No dose adjustment is necessary for elderly patients (see PRECAUTIONS , Geriatric Use ) or for patients with hepatic or renal impairment. Oral ANZEMET at a dose of 100 mg prevents nausea and vomiting associated with moderately emetogenic cancer therapy as shown by 24 hour efficacy data from two double-blind studies. Efficacy was based on complete response (ie, no vomiting, no rescue medication). **/** : No emetic episodes and no rescue medication. § : Median 24-h change from baseline nausea score using visual analog scale (VAS): Score range 0="none" to 100="nausea as bad as it could be." ANZEMET Tablets at a dose of 100 mg administered orally 1-2 hours before surgery and before general balanced anesthesia (short-acting barbiturate, nitrous oxide, narcotic analgesic, and skeletal muscle relaxant) was significantly more effective than placebo in preventing postoperative nausea and vomiting. Efficacy was based on complete response rates (0 emetic episodes and no rescue medication over 24 hours). No increased efficacy was seen with higher doses. One trial compared single ANZEMET Tablet doses of 25, 50, 100, and 200 mg with placebo in 789 women undergoing gynecological surgery. In this study the 100 mg dose produced a complete response rate statistically superior to placebo. The study results are summarized in Table 3. Another trial also compared single oral ANZEMET doses of 25, 50, 100, and 200 mg with placebo in 373 women undergoing gynecological surgery. In this study, the 100 mg ANZEMET dose gave a 54% complete response rate as compared to the 29% rate of placebo. the prevention of postoperative nausea and vomiting. ANZEMET can cause ECG interval changes (PR, QT c , JT prolongation and QRS widening). These changes are related in magnitude and frequency to blood levels of the active metabolite. These changes are self-limiting with declining blood levels. Some patients have interval prolongations for 24 hours or longer. Interval prolongation could lead to cardiovascular consequences, including heart block or cardiac arrhythmias. These have rarely been reported. A cardiac conduction abnormality observed on an intra-operative cardiac rhythm monitor (interpreted as complete heart block) was reported in a 61-year-old woman who received 200 mg ANZEMET for the prevention of postoperative nausea and vomiting. This patient was also taking verapamil. A similar event also interpreted as complete heart block was reported in one patient receiving placebo. A 66-year-old man with Stage IV non-Hodgkins lymphoma died suddenly 6 hours after receiving 1.8 mg/kg (119 mg) intravenous ANZEMET Injection. This patient had other potential risk factors including substantial exposure to doxorubicin and concomitant cyclophosphamide. Dolasetron should be administered with caution in patients who have or may develop prolongation of cardiac conduction intervals, particularly QT c . These include patients with hypokalemia or hypomagnesemia, patients taking diuretics with potential for inducing electrolyte abnormalities, patients with congenital QT syndrome, patients taking anti-arrhythmic drugs or other drugs which lead to QT prolongation, and cumulative high dose anthracycline therapy. Cross hypersensitivity reactions have been reported in patients who received other selective 5-HT 3 receptor antagonists. These reactions have not been seen with dolasetron mesylate. The potential for clinically significant drug-drug interactions posed by dolasetron and hydrodolasetron appears to be low for drugs commonly used in chemotherapy or surgery, because hydrodolasetron is eliminated by multiple routes. See PRECAUTIONS, General for information about potential interaction with other drugs that prolong the QT c interval. Blood levels of hydrodolasetron increased 24% when dolasetron was coadministered with cimetidine (nonselective inhibitor of cytochrome P-450) for 7 days, and decreased 28% with coadministration of rifampin (potent inducer of cytochrome P-450) for 7 days. ANZEMET has been safely coadministered with drugs used in chemotherapy and surgery. As with other agents which prolong ECG intervals, caution should be exercised in patients taking drugs which prolong ECG intervals, particularly QT c .
In patients taking furosemide, nifedipine, diltiazem, ACE inhibitors, verapamil, glyburide, propranolol, and various chemotherapy agents, no effect was shown on the clearance of hydrodolasetron. Clearance of hydrodolasetron decreased by about 27% when dolasetron mesylate was administered intravenously concomitantly with atenolol. ANZEMET did not influence anesthesia recovery time in patients. Dolasetron mesylate did not inhibit the antitumor activity of four chemotherapeutic agents (cisplatin, 5-fluorouracil, doxorubicin, cyclophosphamide) in four murine models. In a 24-month carcinogenicity study, there was a statistically significant (P<0.001) increase in the incidence of combined hepatocellular adenomas and carcinomas in male mice treated with 150 mg/kg/day and above. In this study, mice (CD-1) were treated orally with dolasetron mesylate 75, 150, or 300 mg/kg/day (225, 450 or 900 mg/m 2 /day). For a 50 kg person of average height (1.46 m 2 body surface area), these doses represent 3, 6, and 12 times the recommended clinical dose (74 mg/m 2 ) on a body surface area basis. No increase in liver tumors was observed at a dose of 75 mg/kg/day in male mice and at doses up to 300 mg/kg/day in female mice. In a 24-month rat (Sprague-Dawley) carcinogenicity study, oral dolasetron mesylate was not tumorigenic at doses up to 150 mg/kg/day (900 mg/m 2 /day, 12 times the recommended human dose based on body surface area) in male rats and 300 mg/kg/day (1800 mg/m 2 /day, 24 times the recommended human dose based on body surface area) in female rats. Dolasetron mesylate was found to have no effect on fertility and reproductive performance at oral doses up to 100 mg/kg/day (600 mg/m 2 /day, 8 times the recommended human dose based on body surface area) in female rats and up to 400 mg/kg/day (2400 mg/m 2 /day, 32 times the recommended human dose based on body surface area) in male rats. Pregnancy: Teratogenic Effects. Pregnancy Category B.
ANZEMET Tablets are expected to be as safe and effective as when ANZEMET Injection is given orally to pediatric patients. ANZEMET Tablets are recommended for children old enough to swallow tablets (see CLINICAL PHARMACOLOGY , Pharmacokinetics in Humans ). Controlled clinical studies in the prevention and treatment of post-operative nausea and vomiting did not include sufficient numbers of patients aged 65 years or older - only 5 (0.4%) geriatric patients (all 5 received intravenous ANZEMET Injection) out of 1167 total patients participated in the controlled PONV trials - to determine whether they respond differently from the younger patients. Other reported clinical experiences have not identified differences in responses between geriatric and younger patients. In general, dose selection for an elderly patient should be cautious, usually starting at the low end of the dosing range, reflecting the greater frequency of decreased hepatic, renal, or cardiac function, and of concomitant disease or other drug therapy. The pharmacokinetics, including clearance of intravenous ANZEMET Tablets, in elderly and younger patients are similar (see CLINICAL PHARMACOLOGY , Pharmacokinetics in Humans ). Dosage adjustment is not needed in patients over age of 65. In controlled clinical trials, 943 adult cancer patients received ANZEMET Tablets. These patients were receiving concurrent chemotherapy, predominantly cyclophosphamide and doxorubicin regimens. The following adverse events were reported in >/=2% of patients receiving either ANZEMET 25 mg or ANZEMET 100 mg tablets for prevention of cancer chemotherapy induced nausea and vomiting in controlled clinical trials (Table 4). In controlled clinical trials, 936 adult female patients have received oral ANZEMET for the prevention of postoperative nausea and vomiting. Following is a listing of all adverse events reported in >/=2% of patients receiving either placebo or ANZEMET for prevention of postoperative nausea and vomiting in controlled clinical trials (Table 5). Cardiovascular: Hypotension; rarely-edema, peripheral edema. The following events also occurred rarely and with a similar frequency as placebo and/or active comparator: Mobitz I AV block, chest pain, orthostatic hypotension, myocardial ischemia, syncope, severe bradycardia, and palpitations. See PRECAUTIONS section for information on potential effects on ECG. Gastrointestinal System: Constipation, dyspepsia, abdominal pain, anorexia; rarely-pancreatitis. Hearing, Taste and Vision: Taste perversion, abnormal vision; rarely-tinnitus, photophobia. Hematologic: Rarely-hematuria, epistaxis, prothrombin time prolonged, PTT increased, anemia, purpura/hematoma, thrombocytopenia. Hypersensitivity: Rarely-anaphylactic reaction, facial edema, urticaria. Liver and Biliary System: Transient increases in AST (SGOT) and/or ALT (SGPT) values have been reported as adverse events in less than 1% of adult patients receiving ANZEMET in clinical trials. The increases did not appear to be related to dose or duration of therapy and were not associated with symptomatic hepatic disease. Similar increases were seen with patients receiving active comparator. Rarely-hyperbilirubinemia, increased GGT. Metabolic and Nutritional: Rarely-alkaline phosphatase increased. Nervous System: Flushing, vertigo, paresthesia, tremor; rarely-ataxia, twitching. Psychiatric: Agitation, sleep disorder, depersonalization; rarely-confusion, anxiety, abnormal dreaming. Urinary System: Rarely-dysuria, polyuria, acute renal failure. Vascular (Extracardiac): Local pain or burning on IV administration; rarely-peripheral ischemia, thrombophlebitis/phlebitis. A 59-year-old man with metastatic melanoma and no known pre-existing cardiac conditions developed severe hypotension and dizziness 40 minutes after receiving a 15 minute intravenous infusion of 1000 mg (13 mg/kg) of dolasetron mesylate. Treatment for the overdose consisted of infusion of 500 mL of a plasma expander, dopamine, and atropine. The patient had normal sinus rhythm and prolongation of PR, QRS and QT c intervals on an ECG recorded 2 hours after the infusion. The patient's blood pressure was normal 3 hours after the event and the ECG intervals returned to baseline on follow-up. The patient was released from the hospital 6 hours after the event. A 7-year-old boy received 6 mg/kg of dolasetron mesylate orally before surgery. No symptoms occurred and no treatment was required. The recommended oral dosage of ANZEMET (dolasetron mesylate) is 100 mg within two hours before surgery. The recommended oral dosage in pediatric patients 2 to 16 years of age is 1.2 mg/kg given within two hours before surgery, up to a maximum of 100 mg. Safety and effectiveness in pediatric patients under 2 years of age have not been established. Light pink, film coated, round tablet imprinted with "A" on one side and"50" on the other. Pink, film coated, elongated oval tablet imprinted with "100" on one side and "ANZEMET" on the other. Manufactured by: Patheon Pharmaceuticals Inc. Manufactured for: Aventis Pharmaceuticals Inc.